Lovely Lasagne is so adaptable suiting families, couples and singles, it can be made in advance and sit waiting to be cooked in the fridge to serve piping hot on a chilly Winter’s eve and is equally ‘at home’ being cooked, portioned up and frozen as individual ‘ready meals’ for a quick mid-week feast too. Using the dollop of butter, lightly grease an ovenproof dish. Dawn: I’m using roughly a 4 pints dish which is about 2.3 litres in size. If you don’t have one of these, use smaller dishes, cooking them together in the oven. 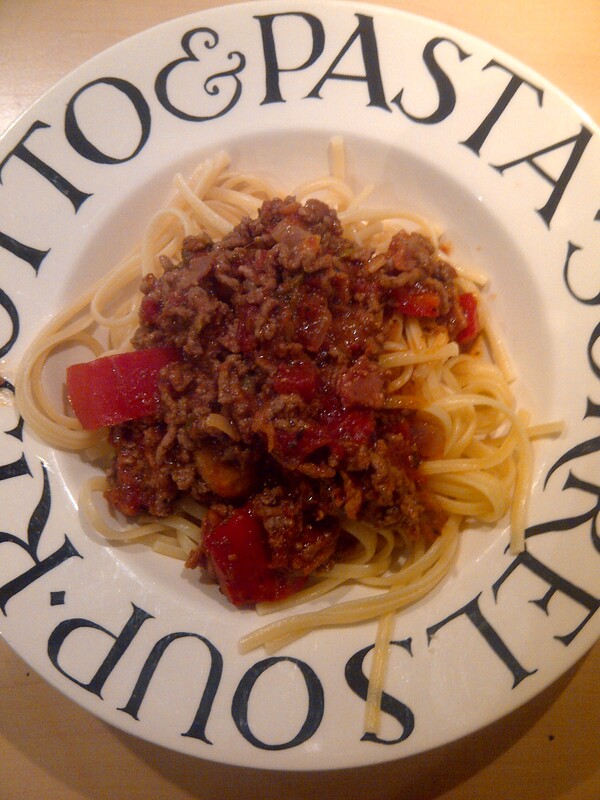 Start with making the bolognese sauce: put the onion into a large frying pan and cook in water until softened. Add the garlic and cook for a further minute. Add the beef and stir the mixture until the meat is browned. Dawn: You will need to break up the mince beef as it comes rather compact and by breaking it up will aid the browning process. Andrew: Yes, and it’s worth pointing out that a meat-free substitute tastes equally as scrumptious as the herbs and other ingredients infuse together making a lovely flavour. Next, add the can of chopped tomatoes and sun dried ones along with the Tabasco sauce, dried basil, bouquet garni and stir all the ingredients together. Andrew: I add sliced mushrooms at this point, too, Dawn. Dawn: I would, too – if I had them to hand! You can also add diced carrot to bulk out the dish, if you wish. At the moment, my fridge has neither so I’m adding what I do have and that’s sun dried tomatoes. Andrew: Good point, Dawn. Basically, use what’s at hand rather than make a special trip to the shops to buy an ingredient. Dawn: Absolutely, Andrew. Sliced and diced courgette is another good ingredient to add as a substitute to mushrooms. Bring the ingredients to the boil and then simmer for about 25 minutes. At this stage, taste and season with salt and pepper to individual preference. Next, make the sauce that sits at each layer of the lasagne by putting the onion, bay leaf and pepper corns in the 350ml of milk and placing over a medium heat, bring almost to the boil and then set aside. Allow to cool for 20-30 minutes to allow the ingredients to infuse into the milk. Next, melt the 25g of butter in a saucepan and when melted, added the flour stirring the mixture until the two ingredients have combined together. Remove from the heat and slowly add the milk, whisking constantly. Andrew: Having first sieved the milk to ensure the additional ingredients don’t make it through! Do you know that pasta simply means dough in Italian, Dawn? Dawn: No, I didn’t. Another interesting fact! Andrew: And, the facts don’t stop there! There are over 500 different varieties of pasta throughout Italy today with only about 50 widely known. Dawn: Another very interesting fact. I do know that pasta comes either fresh or dried with the best commercially produced dried pasta being made from 100% hard durum wheat. Although a carbohydrate, some good quality pastas can contain a percentage of protein and it’s worth remembering that wholemeal pasta helps make us feel fuller for longer. Put the saucepan back on the heat stir constantly until the mixture starts to thicken and has a silky smooth finish to it. Spoon 1/3rd of the bolognese sauce into the overproof dish and cover with a layer of lasagne sheets. To this, then pour 1/3rd of the béchamel sauce. 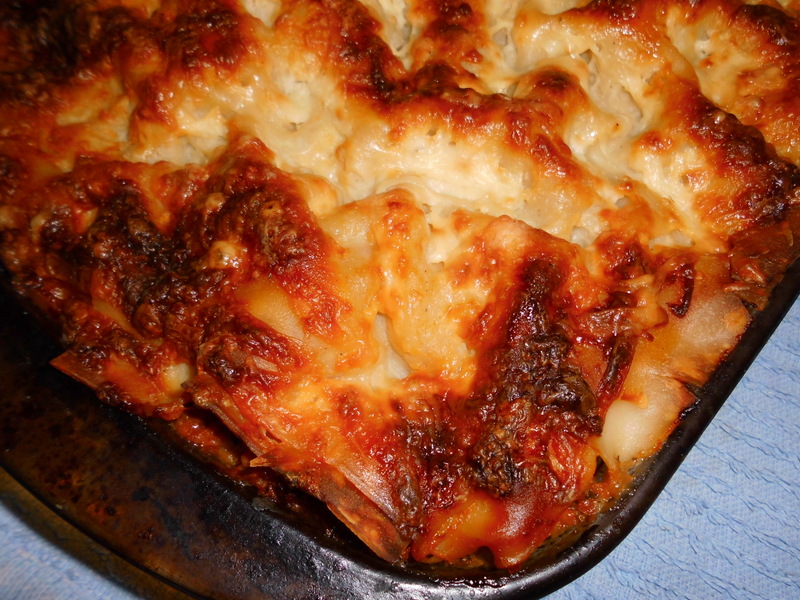 Finish with a layer of béchamel sauce and sprinkle the cheese evenly over the top. Place in the centre of the oven and cook for 45-50minutes or until the cheese is bubbling away and the top has turned to a nice golden to medium tone of brown. Dawn: Or serve with a ‘healthier’ version of potato wedges which we’ll be sharing with you soon. Andrew: Mmm…sounds like a real Winter treat! For tasty, easy and inexpensive dishes and meals that won’t break the bank, follow the Cooking Duo’s blog here and our Twitter account @Love_Food_UK and see you all soon!